Oops! You’ve just lifted the lid off of the deadly bug jar. And there’s no turning back now. Learn more about some of the world’s deadly bugs by finding out where they live, their preferred prey and how they attack. But don’t be surprised if your skin starts to crawl. You’ve been warned! Below you will find deadly bug encounters from around the world and read about some of the war stories between humans and insects. Fire ants defend their mounds by swarming the intruder and applying a fiery sting. 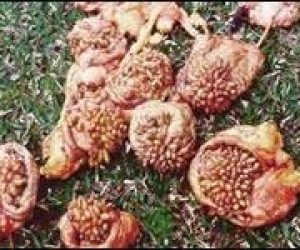 In 1998, A 67-year-old female Mississippi resident was attacked by about 500 fire ants while confined to her bed in a nursing home. When the patient’s bed covers were pulled back during a routine nursing check, a swarm of fire ants were found crawling in her bed as well as on her left arm, chest, neck, stomach and back. Twenty-four hours later more than 500 fire ant pustules were counted on her body. Luckily, she survived. It’s reported that she was walking down the street when it happened. The 77-year-old Las Vegas woman barely escaped alive when she was attacked by a swarm of killer bees and stung about 500 times. The woman, who was stung on her arms, face, chest and head, was rescued by firefighters wearing sting shields (plastic bubble helmets) who doused her with water. The attack was the second one reported in the Las Vegas area since January 2000. On February 9, a 79-year-old man was attacked by Killer bees after pounding a stick against his backyard fence that apparently had a hive inside. He was stung about 30 times and survived the attack. And in October 1999, a swarm of the bees killed a dog and attacked a young girl who was trying to protect the animal. Luckily, the girl was not seriously injured. During one killer bee attack, a man was so terrified when he was swarmed by the bees that he almost burnt his house down. Apparently, when the man found himself surrounded by the bees he tried to light a fire in his backyard to ward off the massive bee invasion. This page is your guide to deadly bug defence. Here you’ll find crucial information on what to do if you are stung, bitten or otherwise attacked by any of the deadly bugs featured on this site. As you will learn, in most cases a deadly bug encounter does not necessarily carry an automatic death sentence. The first thing to do if stung by a scorpion is not to panic because very few deaths occur from such stings if medical attention is easily accessible. Follow these steps to avoid further illness. Do not cut the area that was stung and do not try to make it bleed because both of these actions will only make things worse. Do not drink anything, especially alcohol. Clean the site with soap and water. Wrap a bandage firmly over the area of the sting and restrict the movement of the area that was stung. This will keep the venom localized for many hours. Clean the site well with soap and water. Apply a cool compress over the bite location and keep the affected limb elevated to about heart level. Acetylsalic acid (Aspirin) or acetaminophen (Tylenol) may be used to relieve minor symptoms like cramping and muscle spasms. Treatment in a medical facility may be necessary for children less than five years old or for adults with severe symptoms. Call the poison center for additional information. 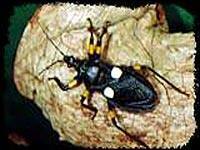 Some assassin bugs like the bloodsucking conenose have a mild bite as compared to the masked hunter, black corsair and wheel bug. Those with certain allergies may experience burning pain, intense itching, swelling as well as red blotches and welts all over the body if they are bitten. If bitten, remain calm and safely collect the bug for positive identification. Relief from bites may be obtained by using lotions containing menthol, phenol or camphor. Contact your local poison information centre to seek medical help. 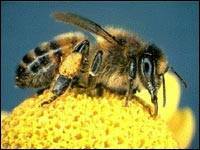 At first glance it is practically impossible to tell the difference between a killer bee and a European honeybee. The most essential advice given to those who find themselves surrounded by killer bees is to run as fast as possible. If caught in a swarm of stinging bees, try to run away and find shelter. Do not swat at the bees because this will only agitate them more. A trip to the emergency room is recommended if you are stung numerous times, especially around the face area. It is best to try and practise prevention to avoid getting bitten by mosquitoes if possible. The following tips can be used to avoid being eaten alive during the warm weather. Minimize contact with mosquitoes by limiting activities during dusk – their peak hours of the day. Wear long-sleeved clothing and pants when venturing into highly infested areas. Wear chemical repellent on exposed areas of skin (but do not apply too often on young children). Keep windows and doors screened in the summer months. Empty all containers throughout the garden that hold water such as potted plant saucers, tires and tins. These act as breeding grounds for the insects. Insecticide sprays, coils and electric mats, can be used around the house to help keep mosquitoes at bay. 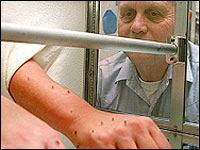 If the bot fly larvae are trapped underneath your flesh it is best to seek medical attention immediately. The information listed below describes the basic steps that may be taken in a medical clinic. 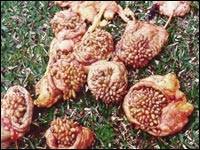 Treatment of this condition can be undertaken by forcing the maggots to the skin’s surface and cutting off their air supply. The maggots can be forced out of the wound by using an application of Vaseline or a similar lubricant. This will expose more of the maggot’s body so that it can be extracted. The maggots can also be extracted by using a local anesthetic and making an incision in the skin. Each year in the U.S. more than 25,000 people seek medical attention for painful fire ant bites and about a dozen of those who are bitten, die from their wounds. If fire ants do crawl onto your skin, they will first bite with their mandibles (jaws) in order to anchor themselves for the thrust of the sting. By taking the following precautions you may escape the wrath of a fire ant colony relatively unharmed. As soon as you feel a pinching sensation, quickly sweep the ants off before they actually sting. This will help you to avoid serious injury. If you must work in proximity to fire ants, wear rubber boots and gloves. The fire ant sting is usually not life threatening on its own, but secondary infections can result. To prevent infections do not scratch the bite pustules. Treat the sting with an insect bite remedy. 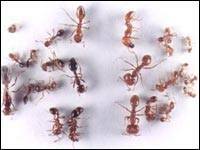 People who are hypersensitive to fire ant venom may experience symptoms such as nausea, dizziness, shock or death. If a person experiences these reactions to the stings they should see a physician immediately. Simply just just want to declare your personal article can be spectacular. Typically the quality in your own submit is barely fascinating so i are able to consider you are an expert on that area of interest. Ok with your authorization well then, i’ll to seize your current feed which keeps modified through new report. Thanks a lot several in addition to you should stick to all of the rewarding do the job.